The Lyman Christy Farmstead is northwest of Meriden in Jefferson County, Kansas at 9001 Christy Road. Lyman Christy purchased his 160-acre farm in two land sales: the first 80 acres in 1879, and the second 80 acres in 1880. Today, the farmstead’s six contributing buildings sit on a 22-acre piece of the original homestead. 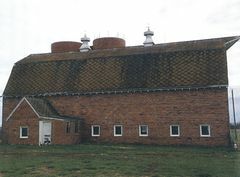 The bank barn, built in 1892, is the most notable of the farmstead’s buildings. Near the barn lies a historic loafing shed, chicken coop, oil house, and tool shed. All contribute to the historic integrity of the farmstead. There is also a hay shed, garage, three grain bins and a ranch house, all considered non-contributing resources. The Lyman Christy Farmstead retains a high level of integrity of location, setting, materials, design, workmanship, feeling, and association. 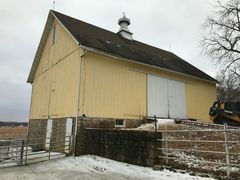 The property is nominated as a Farmstead property type described in the “Historic Agriculture-related Resources of Kansas” Multiple Property Documentation Form. The property’s period of significance begins in 1892 with the building of the barn to 1951 when the farm was no longer used for subsistence farming. 31943 and 31860 W 247th St. The Martin Farmstead is in the northwest corner of Miami County in the Paola vicinity at 31943 and 31860 West 247th Street. The property nomination includes two separate farms, the Endock Martin Farm and the Montie Martin Farm, that were combined once Montie Martin took ownership of both farmsteads in 1924. The farmstead consists of sixteen resources including on contributing site (the farmstead), nine contributing buildings, three contributing structures (the windmill and silos), two non-contributing buildings, and one non-contributing structure. The farmstead was nominated under the Multiple Property Documentation Form “Historic Agriculture-Related Resources of Kansas” with a period of significance established from 1879 when Endock Martin acquired the northeast farm through 1964 with the death of Montie Martin who acquired the southwest farm in 1910. 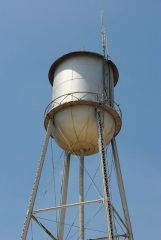 The 1927 Hillsboro Water Tower was constructed as part of Hillsboro's first municipal water and sewer system. The first efforts toward a municipal fire protection system in Hillsboro came in 1888, when the city purchased a man-powered water pump. This $700 implement, which consisted of a tank, pump and hose mounted on a two-wheeled wagon, required eight to ten volunteers to operate it. In an 1897 fire that threatened John G. Hill's Badger Lumber Company, the apparatus proved no better than a bucket brigade. This equipment was used until 1900, when - at the apparent urging of Mayor Hill, who had just lost his coal sheds to fire - the city purchased new equipment. In 1912, the year the city established its first fire department, the city's "water system" consisted of wells and cisterns with a capacity of 11,000 gallons. Without adequate water pressure, all the equipment and firemen in the world proved futile against the inevitable infernos - and a dependably clean water supply would have been impossible. Hillsboro's citizens voted in favor of a bond issue in 1926 and a comprehensive water project was completed in 1927. The 75,000-gallon steel-plated water tower was nominated for its local significance in the area of community planning and development. This building was nominated for its architecture and its association with a women's social organization that was significant for its contribution to the promotion of the arts. 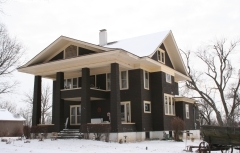 Originally constructed as the residence of Judge Snakey in 1887, two additions have been made to the original two-and-one half story Queen Anne home. The first addition, done in the Commercial style, was completed in 1925. In 1931, George Siedhoff was hired as the contractor for an Art Deco addition designed by Lorenz Schmidt. Louise Caldwell Murdock founded the 20th Century Club as a part of the Chautauqua movement in January 1899. The 20th Century Club grew from 110 members at its inception to over 1,500 members in 1963. The club purchased the Judge Snakey home in 1923 to use as a permanent clubhouse. 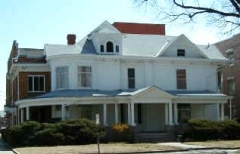 The 20th Century club continually worked to promote performing arts, literature, and science in Wichita. 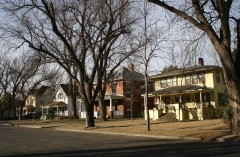 The 800 West Douglas Historic District (809, 811, and 815 West Douglas) in Wichita was nominated for its association with the early town of Delano, located just west across the Arkansas River from Wichita. 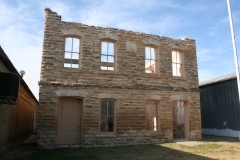 In 1880, Delano was incorporated into the City of Wichita as its fifth ward. Today the area is known as "West Wichita." 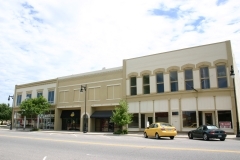 Between 1887 and 1906 construction of the three contiguous, two-story commercial/residential buildings by prominent business men, Christian Kimmerle, Fred W. Israel, and L. Frank Means, helped turn Delano into a thriving commercial district during the first two decades of the 20th century. 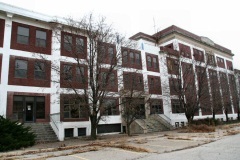 The 800 West Douglas Block is one of the only remaining pieces of the once thriving Delano commercial district. The 900 block of North 7th Street in Garden City developed during the early 20th century into one of the city's finest residential areas, and it reflects the growth of this ranching, agricultural, and industrial community. Local bankers, lawyers, merchants and ranchers flocked to the North 7th Street neighborhood to build their homes. The neighborhood is locally known as Silk Stocking Row because of the saying around town that the people living on 7th Street were the only ones who could afford silk stockings. The small district includes five single-family residences that reflect a variety of turn-of-the-century architectural styles including Queen Anne, Colonial Revival, and Four Square. The ATSF Steam Locomotive #3415 is a Class 3400 Pacific-type 4-6-2 passenger engine built by Baldwin Locomotive Works in 1919. The 4-6-2 designation refers to the engine's wheel arrangement - the first number notes the number of leading wheels, the second number notes the number of driver wheels, and the third number notes the number of trailing wheels. This engine originally burned coal, but was converted to oil burning in the 1930s. 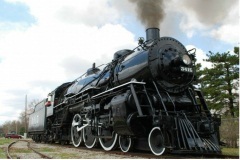 It was operated by the Atchison, Topeka & Santa Fe Railroad for 34 years and was donated to the City of Abilene in 1955. It sat in Eisenhower Park until 1996 when it was removed from the park for restoration. The locomotive is now situated on an abandoned segment of the Rock Island Railroad track that is used by the Abilene-Smoky Valley Railroad, a not-for-profit organization that operates a railroad museum and excursion train. When not in use, the locomotive is stored in the engine house at 411 South Elm Street in Abilene. It is one of only three 4-6-2 3400 class Pacific-type steam locomotives remaining in Kansas, and the only member of the class that is operational.